This keynote will showcase Cinematic Rendering, a rendering method that simulates the interaction of visible photons with scanned patient anatomy from standard CT or MR imaging. The algorithm employs a Monte Carlo path tracing method, which generates photo-realistic or even hyper-realistic images by light transport simulation along hundreds or thousands of photons paths per pixel through the anatomy using a stochastic process. The medical data is illuminated using image based lighting by high-dynamic range (HDR) lighting environments, which can either be captured photographically or generated synthetically. Photographically captured lighting leads to a very natural appearance of the data when compared to images created using the traditional ray casting method. Such natural lighting in combination with the accurate simulation of photon scattering and absorption, leads to photorealistic images that resemble many shading effects that can be observed in nature, such as soft shadows, ambient occlusion, volumetric scattering and subsurface photon interaction. By modelling a virtual camera with variable aperture, focal length and exposure, effects such as depth-of-field and motion blur can be produced. Such photorealistic images and animations provide great value for reporting, patient-doctor communication, anatomical education, marketing, and surgery planning, and may support diagnostic imaging by providing meaningful overview visualizations., Monte-Carlo path tracing has been too computationally expensive to be used in real-time applications before now. Recent advances in GPU technology and algorithms now allow interactive rendering of volume datasets using this method. The talk will present technical challenges and solutions for this real-time, physically based visualization method as well as applications of the technology in medicine and beyond. Since Cinematic Rendering provides many artistic tools to generate rendered images, the intersection of arts and visualization will be another focus of the talk. 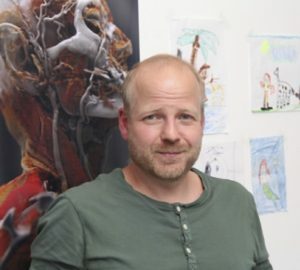 Bio: Dr. Klaus Engel obtained his doctoral degree from University of Stuttgart, and is now Principal Key Expert for visualization at Siemens Healthineers, Strategy and Innovation. With his colleagues, Prof. Dr. med. Franz A. Fellner and Dr.-Ing. Robert Schneider, Dr. Engel developed a new technology called Cinematic Rendering. The technique employs near-natural artificial lighting that imitates the complex propagation and changes in light. Clinical images from inside the body can be depicted in a fully new “hyperrealistic” form. The technology is also already being used at the Linz University Hospital as a special tool to prepare for operations. Since summer 2017 Cinematic Rendering is also being tested at the University Clinic Erlangen as a tool in the planning of surgical procedures of the liver, gall bladder or pancreas. In 2016, Dr. Engel was awarded the Inventor of the Year in the category “Single Outstanding Invention” at Siemens AG for his contribution. Abstract: This talk provides an overview of the history of Mixed Reality (MR) and Augmented Reality (AR) in medicine, and particularly in image-guided interventions (IGI). Beginning with early work using head-mounted displays in the 1990s, it traces the evolution of AR techniques in the operating room (OR) to fuse various imaging modalities with the real-world view of the patient. The earliest application of AR in intervention integrated an ultrasound image of underlying structure with the patient, and this was followed by a project that fused pre-operative imaging with operating microscope images in the OR. Many additional approaches have been employed, using semi-transparent mirrors, head-mounted displays, projection systems and pseudo-holographic integral videography displays to facilitate the combination of multiple imaging modalities with the patient in an intuitive manner. As new and unfamiliar display technologies create challenges related to human-computer interfaces and perceptual psychophysics, the chapter presents some of the issues that can inhibit the appropriate intuitive visualization of the real and virtual worlds in the medical context. 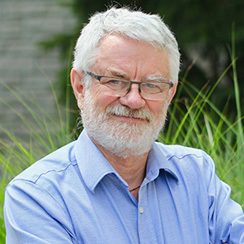 Bio: Dr. Terry Peters is a Scientist in the Imaging Research Laboratories at the Robarts Research Institute, London, ON, Canada, and former Director of the Biomedical Imaging Research Centre at Western University. He is a Professor in the Departments of Medical Imaging and Medical Biophysics, and a member of the School of Biomedical Engineering at Western University London, Canada. His research focusses on the application of the development of advances in image-guided surgery and therapy surgery and therapy. He has authored over 300 peer-reviewed papers and book chapters, and has mentored over 90 trainees. He is a fellow of the IEEE, The MICCAI Society and the Royal Society of Canada.